When Pit Keeper enters the battlefield, if you have four or more creature cards in your graveyard, you may return target creature card from your graveyard to your hand. Gattison on Holy Chit, Earring Ghosts! PooperDix: Lol. S'alright, I like weird suggestions, plus I do the same thing all the time. I'm notorious for suggesting people replace key, important-to-the-strategy cards in their deck with some janky, theoretically-playable tech. Tortured Existence is another one I don't own, but if I did use it and the Scrabbler, I'd have to do it in a more Madness-themed deck. As for Pit Keeper, I did consider him while building, but you already guessed why I passed him over. I didn't think my GY would be reliably full often enough to get decent use out of him. After playing some games, it turns out I was right, too. 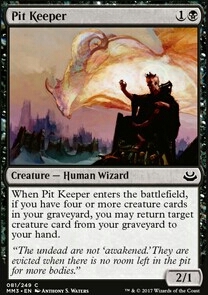 Pit Keeper is a cool card though, and I will use it one day. I promise. PooperDix on Holy Chit, Earring Ghosts! hi! thanks for the reply, i've been playing this deck for a while now but without Viscera Dragger, just to share i'm currently using x2 Unearth for that slot and an extra land. that's for a cheap reanimator for Crypt Rats / Pit Keeper or / Satyr Wayfinder. i'll try viscera dragger sometime, thanks! may i also ask, how do you fight against delver or heavy counter decks? delver decks is one of the reason why i'm running Unearth to have more treats for them to counter. Alright then! We can start working on improving the aspects you want. The suggestions will be easy to make, but be warned after all of this is said and done you will find yourself in the tough spot of making cuts to fit the 100-card limit. As a start, I would suggest cutting all proliferate effects in the deck, as this is not a dedicated -1/-1 counter deck. You are better off dealing with indestructible threats through other means. 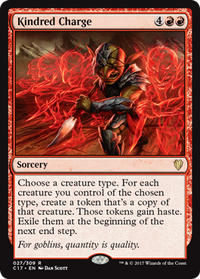 Protecting your threats is not as easy as in abzan colors but jund offers some good cards to help you with that. 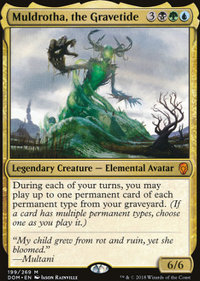 Golgari Charm offers regeneration and added utility in removing enchantments. Heroic Intervention is an all-star in protecting your board. Asceticism is a terrible pain if it's not removed. Wail of the Nim is not as good as the other choices here but it gets the job done. Recovering cards/threats from your graveyard are easy as well. A pet card of mine is Oversold Cemetery. Then you have cards like Victimize, Doomed Necromancer, Pit Keeper, and others already mentioned before. 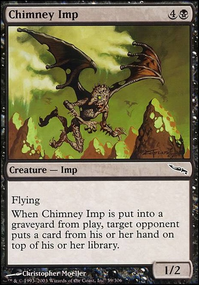 I have an Inalla deck myself that exploits creatures that tap for effects. A very different build than yours, but strong and fun nonetheless. Take a look if you'd like an unconventional take on this commander. With that said, I see a couple of issues with how your deck is built and what your overall gameplan is. I do not know your budget so some suggestions may not be things you'd buy, but they would certainly greatly improve the deck's functionality, and, I promise to keep these to a minimum as well as avoid any Black Lotus kind of stupidity. First and foremost, although your land count is perfect your mana base is slow. And I mean SUPER slow! Almost 40% of your lands enter the battlefield tapped and this is the last thing a control deck wants. You aim to be reactive and keeping as many resources up at all times is very important. Try to replace most of those taplands with others that enter untapped. A relatively budget-friendly option is the pain lands (i.e. Underground River, Sulfurous Springs, and Shivan Reef). Add more basics to enable more of your check-lands to come untapped. Choked Estuary and Foreboding Ruins both are good, relatively cheap alternatives, so are Tainted Isle, Tainted Peak, Smoldering Marsh, and Sunken Hollow. Unclaimed Territory and Ancient Ziggurat are good considerations, while Riptide Laboratory can give a lot of extra utility. Focus on lands that produce blue mana, as that is the central color of your deck. After lands, comes ramping into more resources. Again focusing on Blue the most can be important. You have some decent pieces here but I would consider a few more. Thaumatic Compass Flip and Journeyer's Kite are underplayed cards that can streamline a deck's mana by allowing consistent land drops. If you can, investing in a Chromatic Lantern will solve a lot of problems a lot of the time. What a control deck wants to be is reactive. As such these suggestions are very strong for this kind of decks and if you can I would invest in getting them first: Vedalken Orrery and Leyline of Anticipation are some of the strongest cards in M:TG. These suggestions will help streamline the deck. The last thing I've noticed is that your deck lacks focus and a clear path to victory. 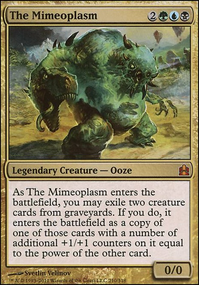 Look for more cheap wizards that have disruptive etb abilities like AEther Adept and Sedraxis Alchemist, or, card filtering ones like Omenspeaker and Augur of Bolas. Pit Keeper is another nice addition to any wizard deck. As for cuts, I would go for Control Magic, Clone Legion, Magus of the Abyss, Vela the Night-Clad, and Yahenni, Undying Partisan as they don't particullarly advance the decks goal in any significant manner. I hope you find this (incredibly long post) useful. By the sounds of it your game plan is to be able to recur the cyclers at some point, also I imagine you have Satyr Wayfinders and Pit Keepers floating around the battlefield at times. A one of sac outlet could just change the math on a Consume Spirit kill if you ever need to shift gears from midrange to combo. Just a suggestion that could help in the odd situation. Other than that it can help avoid your creatures being removed to auras or exile effects. 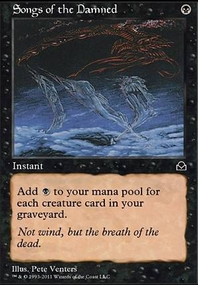 Ghostly Prison is a modern staple for preventing opponent attacks. 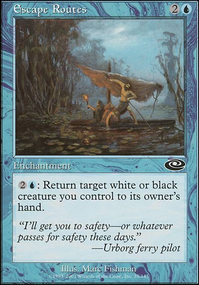 I can't think of very many good ways in modern to get enough mana to extort. Nykthos, Shrine to Nyx might be the best way to create tons of mana for use in extorting. Things like Whitemane Lion with Oketra's Monument can give plenty of extortion triggers. In black, the options are much more limited, since Bontu's Monument isn't as good, but Sedraxis Alchemist looks like the only one that can bounce off the battlefield. Two Pit Keeper or Cadaver Imp can do it if you have a a sacrifice outlet on hand to keep the graveyard going. Relying on the graveyard in modern is dangerous. Maybe Extraplanar Lens, Crypt Ghast, Liliana of the Dark Realms, Nirkana Revenant can help produce mana for extortion? I don't know, I'm just trying to think of the best way to extort. 1# Build an all in deck with the best cheap mill spells, Hedron Crab, Minister of Inquiries, Shriekhorn (a few - as its sadly an artifact), Dream Twist, Contingency Plan - ad 3 playsets of "real" creatures Narcomoeba, Skaab Ruinator, Eternal Scourge - and a flex slot, that at the moment i fill with Stitchwing Skaab, but it could be Magus of the Bazaar. The problem is that this version has obvious problems with stuff like Path to Exile, (and grave hate) despite being really fast. 2# Build a deck that abuses Gifts Ungiven with Skaab Ruinator as win condition (since this creature doesn't need slots devoted to Unburial Rites. In such a shell Mulldrifter, Shriekmaw, Plaxmanta + Pit Keeper as a worse Snapcaster Mage would do well. For turn one stuff like Siren Stormtamer/Martyr of Frost or stuff like Vampire Cutthroat would be ideal. P.s. :Laboratory Maniac is a trap - for this deck. There are alternatives that are a lot better - like Psychic Spiral + Mystic Retrieval which can work out of the graveyard, and mill the opponent out of nowhere.